October 24, 2009, marked the 221st birthday for Mrs. Hale, who was born Sarah Josepha Buell, in Newport, New Hampshire. We decided in honor of her birthday to collect some little known facts from her life’s work. Most of us can remember learning the poem, “Mary Had a Little Lamb”, but did you know that Sarah Josepha Hale wrote that poem? It was published in 1830. Forty-seven years after that poem was published, Thomas Edison uttered the words of the first stanza to test his newest invention, the phonograph; it was the second successful audio recording to be made and played back. This was done two years before Sarah died. In 1995, more than 100 years after Edison’s use of the poem and one hundred and twenty years after Sarah’s death, the Smashing Pumpkins, an alternative rock band, included a variation of the poem in their song X.Y.U on their album Mellon Collie and the Infinite Sadness. This version isn’t for the little people. Sarah Josepha Hale was so much more than a poet; she was an editor, prolific writer, champion of women’s rights, promoter of child welfare, fund-raiser for civic causes and responsible for making Thanksgiving a national holiday. Sarah is a distant relative of Laurie Halse Anderson. 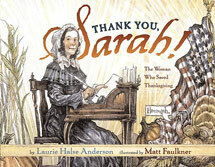 Upon researching her family’s genealogy, Laurie discovered the connection and soon Thank You Sarah, The Woman Who Saved Thanksgiving was written.